« Next Year as Bad as This for Auto Industry? But some claim settlement offers little for frustrated owners. A proposed settlement for low fuel economy would require owners to trade in on new Hondas - but not hybrids. Few buyers expect to get the mileage that automakers advertise. The figures printed in ads and on so-called Monroney window stickers are calculated using a strict government test process that traditionally didn’t seem to have much bearing on real-world performance. But how much is too much? That’s the question the courts were asked to decide when a group of owners decided to file a class action suit against Honda contending that their Civic hybrids were yielding just 31 mpg, not the 49 City, 51 Highway ratings the automaker promoted. The lawsuit, filed in U.S. District Court for the Central District of California, names two plaintiffs but also covers 120,000 other owners of 2003 through 2008 Honda Civic Hybrids. While Honda dismisses the claims – it says it relied on government data, as do its competitors – and insists it has done nothing wrong, the automaker is nonetheless offering up a settlement. But not one many people seem to like. John True, of Ontario, California, will receive $12,500, while the other named plaintiff, Gonzalo Delgado, of Chino Hills, California, will pocket $10,000, if the settlement is approved by the court. And the other 100,000 unnamed owners? They’ll get a $1,000 coupon which they can use to purchase a new Honda. Well, not any Honda. The offer notably excludes the maker’s newest hybrid, the Honda Insight, as well as several other higher-mileage models, such as the subcompact Fit – and the newest version of the Civic Hybrid. Nor can an owner use it on a certified pre-owned Honda or Acura model. To further complicate matters, an owner must trade in their Civic Hybrid. If not, the value of the coupon drops to $500. And for those who might be frustrated enough to think of switching to another brand? If they can prove they complained to Honda about the poor fuel economy of the Civic Hybrid, they’ll get $100 in pocket money. The only ones making any real money are the plaintiffs attorneys, who’ll get cash — $2.95 million, to be precise – not coupons for their time. But one of those attorneys, Jonathon Cuneo, tells the New York Times that doesn’t cover time nor costs, and he insists the deal “provides a valuable benefit” to Civic Hybrid owners. Not surprisingly, the reaction to the terms of the settlement has not been very positive. So far, 25 state attorneys-general are asking the court to reject the proposed settlement. Attorney-General Greg Abbott, of Texas, filed a brief arguing it provides “very minimal relief” for the plaintiffs – but actually helps Honda sell more cars. The Japanese automaker isn’t the only manufacturer stung by criticism of hybrid mileage claims. In fact, observers note that has an endemic problem since the first gasoline-electric vehicles came to market a decade ago. While most vehicles tend to deliver lower mileage than Munroney stickers claim, the gap has been especially wide for hybrids. The Environmental Protection Agency, which administers the federal fuel economy testing system, has tried to bring its tests more in line with real world driving conditions, leading to a revision in testing and rating procedures for the 2008 model-year. Since then, the Civic Hybrid shows a mileage rating of 40 mpg City, 45 Highway, still well above what many drivers are getting. Hybrid makers note that motorists can improve their fuel economy by learning how to take advantage of the way the vehicles work – for one thing by driving less aggressively off a stoplight. To help Civic Hybrid owners do better, Honda will also send out a DVD showing how to maximize fuel economy as part of the proposed settlement. This entry was posted on Tuesday, December 15th, 2009 at and is filed under Automobiles. You can follow any responses to this entry through the RSS 2.0 feed. Both comments and pings are currently closed. 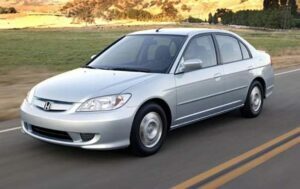 I own a 2006 Civic Hybrid. I continually got 45-50 mpg when it was new. The mileage dropped in the Winter months. Last year, I replaced the original factory installed tires with another brand, and my miles per gallon has dropped. On a recent road trip of about 2500 miles, I averaged 44 miles per gallon during the month of November through midwest states. Driving habits help! Thanks for giving us a first-hand report. I have heard many different stories from hybrid owners, over the years, including the host of a major NPR show who insists he often gets significantly more than the rated mileage on his Prius. But at other times, he admits, his numbers drop to little more than the low 30 mpg range. I strongly recommend that anyone considering a hybrid first see whether their driving conditions work with a hybrid, which means mostly stop-and-go v highway, where the hybrid system is largely inactive. Then they need consider their personal driving style. Someone with a lead foot will need to learn to drive very differently or the hybrid won’t yield much of a benefit. To be honest, I’m not impressed with the idea that you should have to relearn to drive a hybrid. You could do the same thing with any car, and studies have shown that often can yield, 10-20% even more of an improvement on any vehicle. For those for whom a hybrid isn’t necessarily a good fit, I strongly recommend they consider a diesel if mileage is a critical concern. That’s an especially good choice for those doing a fair bit of highway driving and the sacrifice for performance driving is far less significant, which is why a number of comparison tests have found diesel models delivering better mileage — never mind performance and towing capacity — v comparable hybrids. You made another critical note regarding your tires; hybrids are usually outfitted with special low-rolling resistance rubber that, by itself, can yield significant improvement in fuel economy, but again at a trade-off in handling and performance, Winter grip, etc. The Prius takes things to the extreme, with lower mass materials to reduce weight, special aerodynamics, and so on. These various steps can improve mileage nearly as much as the Hybrid Synergy Drive, itself. You’ll see a lot of that migrate to conventional vehicles, in the coming years, which is why even vehicles with conventional gasoline engines will be delivering double-digit improvements in mileage.